In the 1960's the large 20" dolls gave way to a smaller, Barbie size 11 1/2" Dollikin called Fashion Dollikin or Action Dollikin. They had 14 points of articulation and a wardrobe of outfits was issued as well. This size doll was made until 1972 and then a smaller, Dawn size 6 1/2" Dollikin was issued called Little Miss Dollikin. Three of my 11 1/2" Dollikin dolls. The Action Dollikin in the box and the brunette in the white jumpsuit are both from 1972. The Dollikin in pink is called Fashion Dollikin and her box dates her from 1969. Two mint in box Dollikins, one 11 1/2" and the 6 1/2" Little Miss Dollikin. 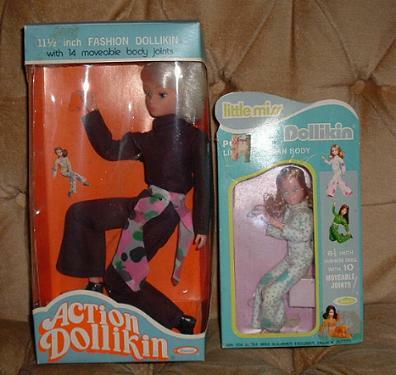 Here is the Fashion Dollikin from 1969 and a Little Miss Dollikin. Two 6 1/2" Little Miss Dollikin dolls. There was also a rare African American Little Miss Dollikin. These dolls had only ten moveable joints. A comparison of all three sizes of Dollikin dolls to show differences in bodies. The 20" dolls from the 1950's were a high quality hard plastic. The 11 1/2" and 6 1/2" dolls were a lighterweight plastic and lesser quality.